Are you searching for affordable thermal imaging scopes? Unsure if you can pull the trigger on an optic that costs several thousands of dollars? We have a lineup of thermal scopes that are reasonable in price when you can easily rack up a $10,000 bill. Without maxing out your credit line, we’ll get you clued in to what’s new and hot, and what scope will best fit your needs. We’ll also educate you on what thermal considerations you need to know about before you buy! You can’t help but invoke flashbacks of the 1987 Arnold Schwarzenegger “Predator” movie at the mention of thermal vision. If there’s one thing to remember from the classic, action-packed movie, it’s that you can change the way you hunt and stalk your prey when you have alien technology on your side. As sci-fi and alien as thermal imaging may seem, it’s not extraterrestrial technology that allows you to see what’s creeping and crawling in the dead of night or in covert stings. Thermal scopes display temperature information, and because thermal imaging products will vary greatly in quality, display resolution is an important factor to consider when buying a thermal scope. Infrared imagers or cameras are made to pick up part of the light spectrum in the 700-1000nm region. Thermal imagers are able to operate in the 8000-15,000nm part of the spectrum. While we see and interpret what is displayed on the scope as color differences, they are actually temperature differences between objects emitting varying levels of radiation. Sounds cool, right? But, is it “too much scope?” How can you use a thermal scope to justify purchasing the expensive tech? Being able to spot game, identify predators, get eyes on intruders, and track downed game are just some reasons you may want thermal tech. Because it’s an active device, you can use thermal at any time during the day or night. Let’s check out what your options are if you’re serious about being the hunter and not the hunted. Full-featured and high-quality optics is what Trijicon does, and they nailed it with the IR Hunter MK3 scope. This IRMK3-35 model from the Trijicon Electro Optics Division is one of the top dogs of the line. Brilliant precision, detailed reticles, and digital technology spells out expensive. It’s not for everyone, but superior scopes worth their grit rarely are. Mounting this serious scope will add just over 2 lbs of weight to your weapons system but no surprise there – thermals aren’t lightweight optics. What it also isn’t is cheap. There’s very little chance you’re taking home the IR Hunter unless you’re prepared to spend a significant amount of cash. For those of you who are, it has a 35 mm Germanium objective lens with a replaceable, highly-transmissive IR window to protect it. The scope’s optical magnification is 2.5x, and you also have 8x E-Zoom to get a closer look. It’s also important to note that the 8 reticles available in the system are high-precision reticles that scale in size as you change magnification. Yes – it’s equal to a FFP (first focal plane) reticle seen in high-end rifle scopes. But, unlike traditional scopes with the elevation turret on top and windage turret on the right side, the IR Hunter reverses the location of the two turrets. It might take some getting used to, but we thought you should know. White-Hot and Black-Hot imaging, 640×480 sensor and display resolution, and multiple advanced features to achieve target recognition, focus, and contrast, you can bet these stats set the standard for the best thermal imaging you can have on a scope. The IR Hunter is a battery hog. You’ll run out of juice around 3.5-6 hours in, but at least it can conveniently be taken off for uploading data and battery replacement since it comes with a dual lever LaRue tactical quick detach weapon mount. Edge Detect, Enhanced Target Recognition (ETR), Digital Contrast Enhancement (DCE), and a Stadiametric rangefinder are features that will forever change the way you see a hunt, whether it’s for hogs or fugitives. The Apollo Pro MR scope is the real deal. It’s loaded, jam-packed, crammed to the seams with what seems to be an endless list of features and technology to give you sight at night. The best thing about it? It just may be the most advanced clip-on system you will ever come across. If you want to use the same weapon for day and night purposes, you’ll need a clip-on. Clip-on systems give you the functionality to hunt, surveil, search, and detect with the benefits of thermal without changing weapons or going through the hassle of a full mounting process and re-zeroing your scope every time. At least, that’s what the Apollo Pro MR claims to do. As a clip-on thermal scope, it’s designed to sit in front of your daytime scope. You’ll need to purchase an extended weaver or Picatinny rail to allow mounting. While it can be locked down to the rail for a secure and tight mount, it can be removed with its quick-disconnect system. Even though it’s specifically designed to work in front of your magnified sight, it can also be used as a stand-alone monocular. This model has a 50 mm objective lens, 30 Hz refresh rate, and 640×512 sensor resolution. Optical magnification is 1x, but with digital zoom, you can scale your way up to 2x, 4x, and 8x power. 4 reticle color and 6 pattern options are available and so is a variety of imaging modes that includes White Hot, Black Hot, Rainbow, and more. A wireless remote is also included for quick operation without taking your eyes off the sight picture or changing your armed position. You also have two battery options to take advantage of: four CR123A V or 4 AA batteries that will keep you out for about 7 hours max. FLIR takes the approach that the less you have to do on your weapon and sights system means more time out in the field. The FXQ38 thermal scope from Pulsar is a two-in-one optic designed for use as a thermal monocular and as a clip-on attachment to your scope. Check out your surroundings up to 1475 yards (1350 m) and then clip it on to the end of your daytime rifle scope for thermal imaging power. It’s that easy! The convenient feature about the Pulsar Core forward scope is the rail-free design that allows mounting directly to the objective bell of your daytime rifle scope. Simply switch out the interchangeable eyepiece with the mounting coupler needed to fit the rifle scope and you’re good to go thermal for the rest of the hunt or special ops scenario. Unfortunately, the coupler needed to attach the FXQ38 doesn’t come included as an accessory, so you’ll have to buy it separately. It comes in three sizes: 42, 50, and 56 mm to fit the objective bell of your scope. It’s important to note the internal bushings on the couplers must be sized with the outer diameter of the scope – not the objective lens size. If you’re willing to get the extra piece to turn the monocular into a mounted scope, you’ll appreciate the light weight of only 13 ounces that won’t significantly affect the balance of your overall weapon and scope system. It has a green OLED display that you might initially confuse with night vision, but to be clear, it’s a thermal imaging scope. You can change the polarity between Black Hot and White Hot, but it will still be reflected in green tones. What’s the IRIS technology? It’s their detection and recognition software that allows you to clearly see targets at distances over 1000 yards. With a 384×288 50Hz sensor, image quality is above par. It’s not a bells and whistles type of scope as it ditches features such as a rangefinder, video out, and other internal options. But, as a compact, easy-to-use forward thermal rifle scope, it leads the pack in ingenuity and performance. The XQ line of Trail scopes are the entry-level models, as if spending around a few grand is entry-level in anyone’s books. But, when it comes to thermal imaging rifle scopes, the good stuff never comes cheap, and you get what you pay for. So, does “entry-level” and a few grand get you anything good? Let’s scope it out. Not surprisingly, the Trail XQ scope is a popular optic. It’s not outrageous in price as thermal optics can get, and it still has all the fixings you need to identify and spot elusive prey. To start with, there is some model confusion since there are a couple of XQ scopes available. The 2.1 and 2.7 designations refer to the base or beginning magnification of the model. This is the 2.1 model which is the Trail XQ38 with a beginning magnification of 2.1x and a 38 mm aperture. The sensor specs on an XQ Trail is 384×288 resolution with a 17 µm pixel pitch. The main difference between this model and the Trail XP38 is the 640×480 sensor and display resolution, and of course, the price. Features and capabilities remain identical between the two Trail scopes. It’s an excellent scope made for the field or timber as it’s been shock and recoil tested to be mounted to hunting rifles up to and including 375H&H. It’s also fully waterproof and is IPX7 rated. For a thermal scope, it’s also on the lighter end of the scale, weighing approximately 18 ounces. It has an impressive 1476-yard (1350 m) detection range. The XQ38 comes with a wireless remote control, and it can connect to WiFi via your smartphone and the free, recommended app for live streaming and uploads. Other digital features include a Stadiametric rangefinder, digital zoom, multiple zeroing profiles, and a built-in accelerometer. What’s not to love about the Pulsar Trail scope? It has just the right amount of tech and quality to balance out the price without being too tedious and difficult to use. Now, that’s a thermal rifle scope worth buying. While thermals can be used in both day and nighttime conditions, they shine best when the sun goes down. Since the sun can heat up the surroundings and essentially wash out the sight picture, the best time to use it would be in the dark. What can the Thermosight R Series scope help you do in the dark? Be the hunter and not the hunted. It’s a given that thermal optics are going to be pricey. But, the RS64 2-16X thermal night vision scope may not be as feature-packed or high-end as its high price may indicate. If forgoing digital features such as a rangefinder, accelerometer, and other such whistles is the idea behind keeping the scope as a simple device, then its foundational features ought to hit it out of the ballpark. Scanning over the scope from top to bottom, you’ll notice it has a huge 60 mm objective lens. That feature alone is going to tack on some weight to the overall package, and it definitely contributes to the approximate 2 pounds you’ll be lugging around. It can also achieve up to 16x magnification for some extreme close-up views. The RS64 has a 640×512 Vox core sensor, 30Hz frame rate, and an LCD display with 640×480 resolution. The scope is marketed as a non-game hunting optic designed to help with varmint and pest control at night. Critters and animals such as hogs and coyotes are examples of non-game animals. It’s been recoil-tested to be compatible with MSR semi-automatic weapons up to .308 caliber rifles. With 6 display palettes, 3 reticles, and 4 reticle color options, you can quickly adjust the sight picture to the right level of vision comfort with the easy 4-button interface. Keeping things simple seems to be the way to go. Less fussing around means more hunting and shooting. This 3-12×50 thermal rifle scope is just one product model from the popular series of Zeus 336 scopes. They’re designed to be the ultimate value scope that balances out quality and features with price. 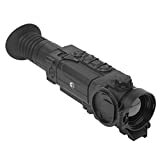 Primarily designed as a weapon scope, it’s suitable for a range of applications that includes military use, law enforcement and SWAT purposes, and even for the committed hunter out in the field. What’s your game plan? The Zeus 336 has FLIR’s Tau 2 17-micron uncooled core technology with the latest upgrades and improvements. This model has a 30Hz refresh rate, multiple color palettes, and reticle options including a “no reticle” setting. You also have digital zoom to progressively increase your power range at 1x, 2x, and 4x magnification. The large 50 mm objective lens is made with Germanium. The body has been made with CNC-machined aircraft aluminum alloy to keep its weight down to 1.5 lbs. It’s 10.2 x 2.9 x 3.3 inches in size and is compact for a thermal optic. You can wield the Zeus scope as a portable, handheld monocular if you wanted to. The scope is also loaded with various imaging tools that you can adjust and switch between, such as Active Contrast Enhancement (ACE), Smart Scene Optimization (SSO), Automatic Gain Control (AGC), and more to significantly improve and fine-tune your sight picture. However, there seems to be some quality control issues with Zeus 336 scopes whether it be grainy sight picture at zoom power or electronic disfunction in some form or another. Fortunately, the scope is covered with a 3-year warranty and 10-year warranty on the detector. It’s not a decked-out thermal scope, but it’s made to be an intuitive, high-functioning thermal unit for the field. If you’re out to hunt down hogs and coyotes at night, you’ll need the strength of a mighty Thor at your side – not the superhero, but the ATN Thor thermal imaging scope. It’s a nighttime prowler that has smart technology, ballistic data, and long-ranging detection capabilities that will make your hunts more productive. For a hunting scope, it’s lightweight for a thermal optic weighing in at 1.55 lbs. It’s going to add some weight to your rifle, but fortunately, it comes with an interchangeable Quick Release mount if you decide to pack up the scope and shed some weight. However, as a techy gadget, the mini Thor doesn’t like to get wet. It’s only water resistant, so you don’t want to be caught out in a pour-down with the rain-shy scope. You can get some extra detection distances with the 2-8x magnification range. Since magnification is digital, it can get grainy at the higher end, but it’ll still give you that reach you need. Thanks to ATN, they give some specific numbers you can expect to use when out and about. Detection range for this scope is 800 m, at 400 m you will recognize your target, and at 250 m you can identify it. As a true, digital scope, it can connect to both WiFi and Bluetooth. It provides a plethora of digital features that includes a Ballistic Calculator, Smart Rangefinder, GPS, and more. As is expected, there are multiple reticle patterns and colors available to take advantage of. You’ll want to make sure you’re packing an extra set of AA batteries, four to be exact. You’ll get about 8 hours of straight-up use out of it before you’ll need to give it fresh juice. If you have any quality issues upon box opening, be assured the Thor HD 384 comes with a 3-year warranty to protect your investment. The Thor 4 rifle scope series came about as a fulfillment to demands made by hunters and shooters alike. Day or nighttime shooting, it doesn’t matter. If you need the kind of detection that keeps you at a distance while you can watch and stalk your unwitting prey, the Thor 4 was made to provide it. Here’s what you get when you combine smart tech and next generation quality together. 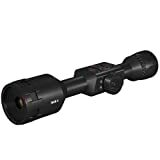 This Thor 4 384 1.25-5x scope is at the lower end of the price and magnification range for the Thor 4 series of scopes. With low power, detection range is a max of 750 m with an identification range of 205 m.
The thing is, quality control issues seem to be related to firmware glitches and actually being able to use the scope without it powering off. However, this isn’t an issue that ATN experiences alone. Many digital scopes, regardless of brand, often have electronic issues. The Thor 4 scope has a 3-year warranty, and you’ll want to be vendor-specific when you’re ready to buy. If you’re ready to pull the trigger on a cheap thermal scope, you’ll appreciate the surprisingly, high-quality thermal imaging. It has the dual core 4th gen sensor with a 60Hz refresh rate. That 60Hz will come in handy when you’ve got moving targets in field of view. It has many digital features that you may have heard of: Ballistic Calculator, Smart Rangefinder, One Shot Zero, and Video Recording and Dual Streaming. Of course, there’s probably more features than you’ll ever use equipped on the Thor 4, but it’s your prerogative to have them. You won’t have to worry about these endless features eating up battery juice since the scope has an ultra-low power consumption rate. You’ll get 18 hours of practical use before needing to recharge your Thor. It’s designed to be a high-performing and smart optic, but it’s still at the entry-level end for a digital scope. If you’ve got a strict budget to stick to, the Thor 4 may be your only option. FLIR thermals have always been big and bulky, but they’re catching on that we want smaller, more practical sized scopes for a range of applications. The Thermosight Pro PTS736 might be classified as one of their compact scopes, but we’ll give you the real specs on its size right here. This Pro model is not as compact as some thermal weapon-mounted scopes out there. It weighs approximately 2 lbs, and part of that heifer poundage is due to the whopping 75 mm objective lens size. It’s also 11.1″ × 3.5″ × 3.7″ in size – not so tiny after all, right? Despite its “compact” designation, it really is a high-functioning scope worth the hype and cost. When thermal scopes easily ring up in the thousands of dollars, the FLIR PTS736 scope has excellent value for its price. It has some high-end features that you’ll see on only the best scopes that we get into here. While 17-micron is typically the standard for thermals, FLIR takes things to the next level with the PTS736 scope. With 6x optical magnification and a 12-micron Boson 320×256 thermal core, your image quality will be clearer and crisp from edge to edge of the field of view. With a sight picture as clean as what the Thermosight Pro can provide, you can easily stretch the tape for distance. Get dead-on shot after shot at 300 yards and take things even further if you think you have the skill. Other random facts about the PTS736? It’s an easy-to-mount scope since it has a built-in quick detach mount that’s compatible with Picatinny and weaver rails. It’s recoil-rated for .308 caliber and less. It’s super-fast to get booted up since it has a less than 1.5 second start-up rate. It also has a digital compass and inclinometer to work with. The Thermosight Pro is a worthy buy, and it has solid quality behind its core features. That’s what you want in a thermal scope. That’s what you want in a rifle scope, period. Thermal scopes are not cheap or affordable optics. Their technology is still new compared to night vision (NV), and it explains why it’s still so expensive, even next to NV devices. But, thermal imaging allows for an extensive detection range of targets since it’s picking up temperature/heat signatures. Although thermals can be used in both day and night conditions, they’re even more effective at night when temperature differences between objects and surroundings are vastly different. The best thermal rifle scopes can pick up minute temperature differences, and its ability to do so will depend on the thermal detector/sensor sensitivity. You’ll also need to consider how display resolution will affect image quality, and even though high-power scopes can extend your range, pixel quality can become poor with an increase in power. There’s a lot to consider, so let’s break it down for you. The best thermals are going to be over $5000. While these are often the best-of-the-best scopes you can buy, you’ll get practical use from options in the $2000-$5000 range. If you’re looking for a cheap thermal scope under $1000, you won’t find one. There will be some thermal units under $2000 but be brand-specific to get good warranty and money-back guarantee coverage since quality control issues should be expected in this price range. They’re not the same thing. Night vision relies on any ambient light being available. 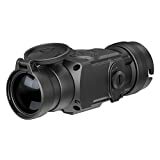 It enhances this light to essentially provide “night vision” capability. Thermal imaging doesn’t provide the kind of detail a NV device does. Instead, it reads temperature signatures in part of the lightwave spectrum that cannot be seen by the human eye. For more on the differences between the two technologies, check out our comparison article. Thermal imaging scopes have been heavy and big. Average weight for a standard thermal scope is around 2 pounds. Lightweight thermals weigh in around 1-1.5 pounds which is comparable to regular daytime rifle scopes. 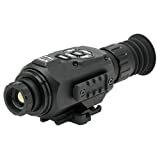 While thermals may be around the same length of traditional rifle scopes, and even shorter, the internal components needed to provide thermal imaging makes them wider. Their overall size and weight will influence your hunting or tactical weapon and sight system. A lightweight and compact option may be to consider a clip-on system. Not only does it shed size and weight, they’re designed to be used in front of your daytime scope and should be easily removeable and attachable. Thermals can provide over 1000+ yards of detection range on targets regardless of day or night conditions. However, the distance at which you can recognize and identify what your target is will be significantly shorter. These ranges will vary between manufacturers, models, and quality. The thermal detector sensitivity will be the prime factor you will want to research. Increasing magnification can help to quickly recognize and identify a faraway target, but it can also cause poor pixelage resulting in a grainy picture. Display resolution will also determine the quality of the sight picture. This is the refresh frame rate that keeps your sight picture updated and looking as natural as possible. They say that the human eye finds it difficult to notice the difference between 30Hz and 60Hz quality. However, if you’re going to be on a moving platform or continuously watching/hunting moving targets, you’ll want the 60Hz upgrade to have the fastest, more natural-looking sight picture for your application. With everything a thermal imaging scope has to provide, you can bet they’re essentially fragile optics. While they’ve been shock and recoil-tested to be used on weapons, they’re still not optics you want to leave exposed to prolonged weather as most scopes will be water-resistant only. Consider build quality to ensure it lasts, and a good repair/replace warranty from a reputable brand is paramount. Many scopes, especially the lower-end ones will have many added features. It can include rangefinders, various recording capabilities, and everything from accelerometers to WiFi and Bluetooth connectivity. While these features are sometimes helpful, be sure to research if they’re built into the scope or if they’re only available via connection to a smartphone/app. These details may influence your decision. However, regardless of added, digital features, you always want to be guaranteed quality at its core. Foundational features such as core technology, resolution, build, and overall quality should always top in as the priority over the tempting add-ons. Thermal imaging can provide clues that not even NV can compete with. You can see visible suspects and game at far-off distances, and for the intelligence-gathering agent, you may be able to see vehicles that were just used. The hunter may even be able to follow the blood trail of recently downed game. Whatever your application, thermal has changed the way a shooter or observer hunts and gathers intelligence. Remain covert. Have the strategic advantage. See details no one else can see. Get thermal!